The Janod Height Adjustable Easel is a great pick if you’re looking to get them used to crafting. After-all easels are a common painting and drawing pre-school prop. With a blackboard on one side it’ll develop drawing skills, while the magnetic whiteboard, with a roll down paper gets them used to painting. Strong enough for two little artists, we recommend inviting a playdate over and encouraging sharing - it’ll help ready their social skills, which is always a bonus! Ok, ok, no-one expects a Countdown genius at pre-school stage. But helping them with their counting means they don’t feel so confused when they start being taught things. This B. Toys Two-ty Fruity Abacus features fruits instead of the traditional beads. Brightly coloured, it’s great for counting, colour recognition and teaching them about their five a day. Love! Pretend play is a huge part of pre-school learning so get them started on the journey with the Donkey I-Wood My First Laptop. Made to look like a real laptop, it has a blackboard as a screen and chalk hidden inside making it great for drawing too. It'll keep crafty and imaginative kids amused for hours and may even help teach them about technology too #winning. If they’re more a visual type of kid, then the Grimm’s Numbers Building Set is great for encouraging number recognition and counting skills. 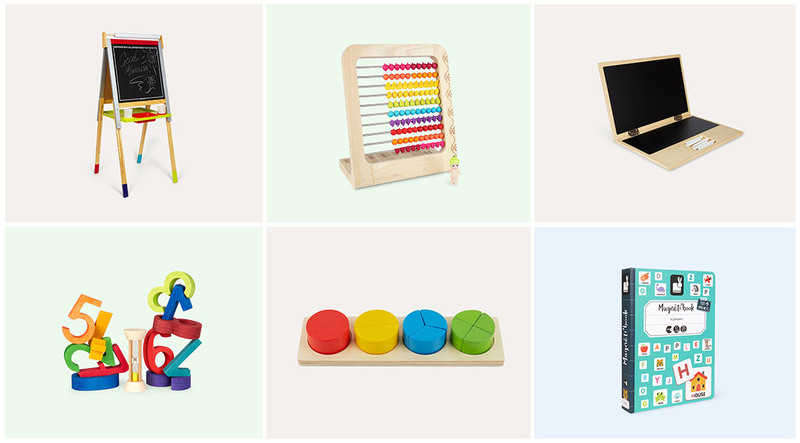 It features chunky, rainbow numbers from 0-9, which can be laid out for basic counting when they are small. As they hit reception age, encourage their mathematical skills by introducing the timer and getting them to add up and subtract as quickly as they can. Long lasting learning...that’s what we like. Shapes and colours are a big deal at pre-school and we know from experience that kids are taught all about this at this time. So give them a lil’ head start with the Bigjigs Circle Fraction Board Puzzle. Featuring 11 different shapes that make up four circles, it’ll encourage them to use their fine-motor skills and improve sorting skills as they match up the colours. Double duty! Learning the alphabet ready for pre-school can be as easy as ABC with the Janod Magnetibook Educational Toy. This cool piece of kit looks like a book, but, when it’s opened, has a magnetic top. Featuring chunky alphabet letters, it’s a great way to teach kids the basics. Then, as they get older, start their simple spellings. All together now... C.A.T.